'Peppa Pig Celebrates Chinese New Year' Has A Viral (And Very Sweet) Trailer : Goats and Soda The popular British cartoon character ushers in the Lunar New Year with a new movie. But it's the live-action trailer — and its story of a loving and lonely grandpa — that everyone's talking about. And now, in the Year of the Pig, Peppa is on her way to becoming a full-fledged movie star. Peppa Pig Celebrates Chinese New Year opened in China this week, the first of the Lunar New Year. But for now, people are talking about the promotional trailer more than the film. Titled "What Is Peppa?" the five-minute live-action trailer tells the story of a grandfather in rural China and his quest to find the perfect gift for his city-dwelling grandson to celebrate Lunar New Year. It's the most important holiday in China, and one that is, above all, about family. For some, it is the only time of year they are able to travel back to their hometown. People walk past a Peppa Pig pop-up shop in the Yu Yuan gardens, a popular tourist spot in Shanghai. 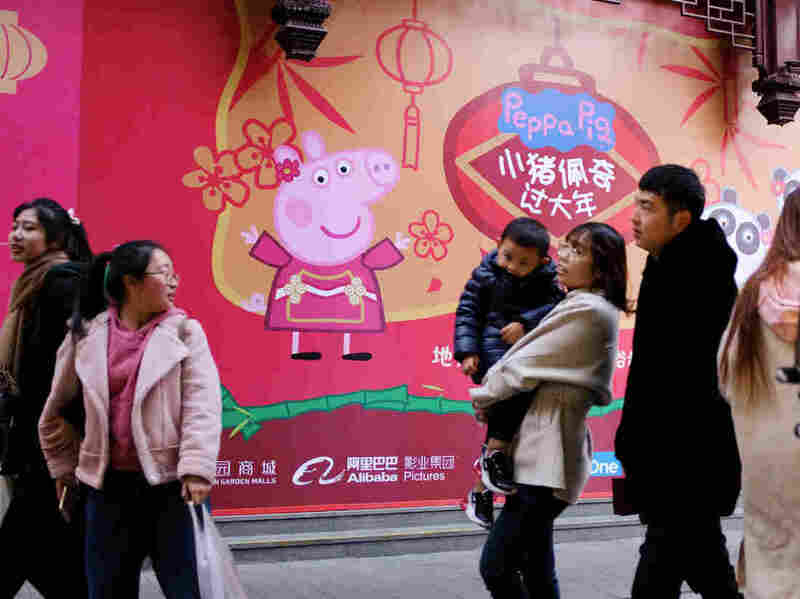 "What is brilliant about this video is that it changes Peppa into a certain feeling, of bringing people together," says Manya Koetse, an Amsterdam-based Sinologist and editor-in chief of What's on Weibo, a website that reports on social media trends in China. "More than just the pig being the film or a toy or a commodity, it shows the gap between the Chinese urban areas and rural areas." The trailer opens on a hillside with an elderly man, Li Yubao, talking on his cellphone with his 3-year-old grandson about the upcoming New Year visit. The man's simple clothes immediately signal that he's one of China's more than half-a-billion rural citizens. The grandfather wants to know what the boy wants as a present. He answers, "Pei Qi" — before Li Yubao's outdated phone cuts out when the antenna — yes, antenna — falls off. Thus Grandfather Li's quest begins: What is Pei Qi? (That's Peppa's name in Chinese.) His devotion to answering this question is at the emotional heart of the trailer. A father spent hours creating a Peppa Pig out of snow for his young daughter. In Chinese, Pei Qi sounds similar to other words: Is it a shampoo? A kind of Chinese checkers? No one knows — until, finally, a breakthrough: A neighbor's wife worked as a nanny in Beijing. She'll know. And she does. She describes the little pink pig to Li, who at first literally tries to paint a live pig. That will not do. So he makes a gift ... and waits. Awakened by firecrackers on New Year's Day, he gets ready for his family to visit. He wraps dumplings, alone. As others greet their returning relatives, the man sweeps his courtyard, alone. Waiting. Nonspoiler alert: you'll have to watch it to find out how it ends. With over 1 billion hits since its Jan. 17 debut on Weibo, China's version of Twitter, the trailer is clearly a hit. But there were some who criticized it for being unrealistic or romanticizing rural life. "That's nonsense," says Koetse. Director Zhang Dapeng has said he used nearly all nonprofessional actors for the trailer, which was filmed in two days in a Hebei province village. The locals wore their own clothes. The story was set in their own homes. "So it couldn't be much closer to the truth," Koetse says. That realism is part of why Chinese audiences loved the trailer — and extends to how the mini-drama hits hot-button social issues. "There is a gap, and it's not just an urban-rural gap but also a gap between young people and older people, in a time where the digitalization of China is going so, so fast," Koetse says. "And especially the older people, and especially those in rural areas, are quick to be left behind if they don't catch up with the latest technology." But perhaps the trailer's greatest strength is the pull of nostalgia — and of family. In China, grandparents traditionally play a prominent role in raising their grandchildren. "Now with the rapid urbanization of China, you see that this is not always possible anymore," says Koetse, as younger generations leave for the cities — and more opportunities — leaving their elders behind. To Koetse, another part of the genius of "What Is Peppa?" is how it takes the idea of quintessentially British Peppa and wraps her up in Chinese traditions and values about familial bonds. "Peppa has never been this Chinese before," Koetse says. Peppa fever extends even to China's People's Liberation Army, as soldiers in Hong Kong assume a pig formation. It's not been all muddy puddles and spaghetti for Peppa. (Those are two of her favorite things.) She made headlines, and not in a good way, when she was co-opted by the Chinese youth subculture known as shehuiren -- which literally means "society person" but actually refers to anti-authority slackers. Koetse explains that this subculture took Peppa as their symbol — and in memes and unauthorized videos, depicted her smoking cigarettes, wearing sunglasses, "making her into something different" and, in the eyes of Chinese authorities, undesirable. As a result, some 30,000 unofficial videos of Peppa were removed from Douyin, a popular short-video platform in China, last year. But that hasn't stopped the #WhatIsPeppa juggernaut. Social media users opined that it made them homesick and want to treat their grandparents better. Wanyu Zhang contributed reporting to this story.